No new kit from me this weekend as I take a little time off to recover from mono (blech! ), but I wanted to share with you a customer who has really caught my eye recently. Kim Stewart is an amazing hybrid artist who is fairly new to digital scrapping. 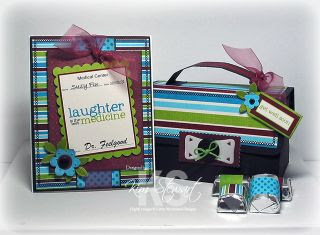 When she sent me a link to her blog this morning, I was blown away by this project using my 9 Out of 10 Doctors Agree kit. So go check out her blog and be inspired!! Thanks for sharing your beautiful work with us, Kim! What cool looking projects with your kit Libby!! So sorry to hear you are sick...hope you are back on the road to recovery soon! Thanks Libby I had so much fun making that project. Hope you're feeling better soon.